Heavy-duty sewing machines are made for the large projects that involve layering of thick fabrics or heavy weight materials in upholstery jobs. When in need to have a machine that sews denim, suede, plastic or leather easily or a machine that handles the weight of heavier fabrics, the heavy-duty sewing machine is the option for you. One of the most important qualities of this type of machine is their stability, which means they are typically heavier, 10pounds the least. Do not be surprised if you find heavy-duty sewing machines that weigh 20 pounds, but keep in mind that this also means less portability for the machine. This is a small issue to consider, as they are able to handle the big projects without tipping or bouncing around. You should also check the durability, the dependability, the versatility of the machine, as you don’t want to end up with something that doesn’t fit your wants and needs. As the market has developed so much, heavy-duty machines are also quite various and their features are also something that tells them apart/or not. 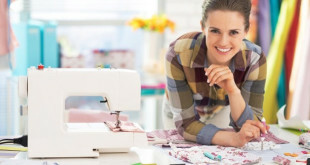 With that in mind and always with an eye on your wallet also, scroll down to check some of the most popular and dependable top heavy-duty sewing machine options out there! One of the great things about the market nowadays is that manufacturers nowadays are designing and making better quality tools, for less money. 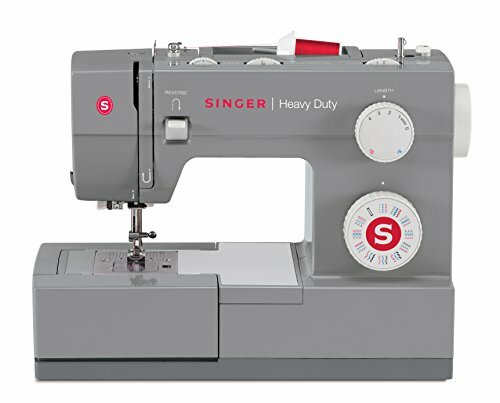 A good example in this case is the SINGER 4423 Heavy Duty Extra-High Speed Sewing Machine that manages to get you through your first stages on sewing, but also takes the heavy-duty jobs for a very good time. The machine comes with 23 built-in stitches so this makes it quite versatile and able to support you on various job applications. The 6 basic stitches are great if you are an entry-lever seamstress, but you can get creative and use 4 stretch stitches, 12 decorative stitches and one buttonhole. The multiple features on the machine make it easy to use and give you speed and efficiency. You can sure be fast using the automatic needle threader, the top drop-in bobbin (that comes with a clear view cover) and the snap-on presser feet. And now that we mention speed, the machine is able to sew 1,100 stitches per minute. The strong motor really speeds up the things, but it’s not loud and runs quite smooth. Remember we talked about durability on heavy-duty machines? Well, the machine has a heavy-duty interior metal frame, which adds weight, durability and better stability. A nice stainless steel bedplate ensures smooth fabric feed in all situations. The four-presser feet on the machine are dependable and their names sure tell you about the job applications. The list includes the zipper foot, the buttonhole foot, the button foot and the all-purpose foot for the more general jobs. The machine has a good build and it’s made to last. Its weight relates to stability when in used and its small size saves the display/storage problem. Don’t get fooled by its looks as the machine, small as it is, it’s actually powerful and reliable. Despite the minimal drawbacks, we still think the machine is great for the heavy-duty jobs, right from the entry-level. 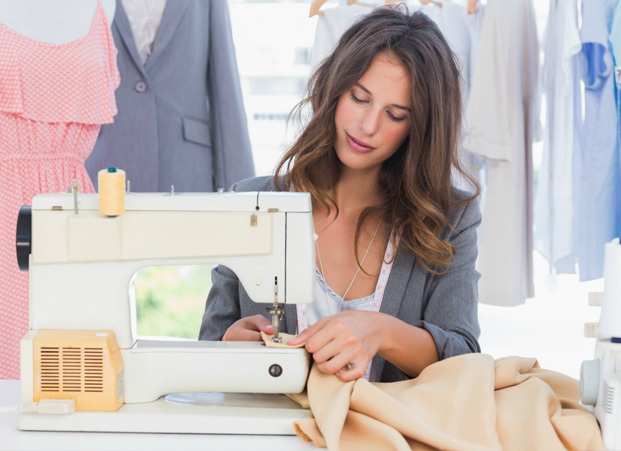 Just because you’re new to sewing, doesn’t mean you shouldn’t prepare for the future jobs and get a machine that is able to take the more difficult jobs. 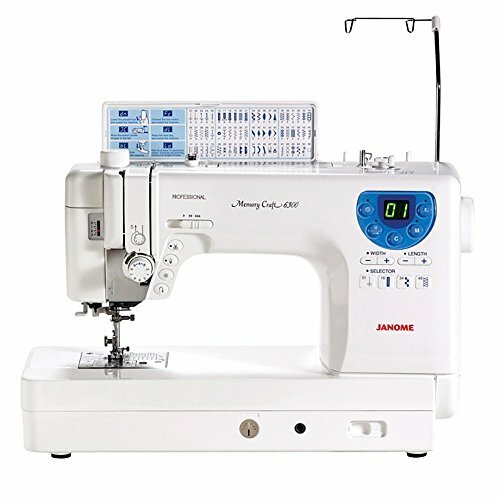 The Janome HD1000 Mechanical Sewing Machine comes with many features and is made to last quite for long since it has a rugged build. The durability of the machine comes from the heavy0duty aluminum body so that the machine takes the intense use. The machine comes with 15 built-in stitches and four-step buttonhole so you sure can try various jobs and styles. You get a strong machine that can easily sew thick layers of fabrics, including leather. The needle threader, the front load bobbin add to the list of features that make you work faster and more efficient. The free arm is great for cuffs, leg pants and the machine also presents drop feed, 3-piece feed dog, reverse stitch lever, vertical push-in bobbin, build-in needle threader. A selection dial lets you set the stitch you need on a job and you also may easily manually set the tension. The machine comes with a high presser foot, along all the other features. You don’t need to worry about having a clustered work area as the machine features a storage tray to store your sewing accessories out of sight, but still handy. Even though the machine is a heavy-duty option, it’s portable and easy to carry. It has a strong build and runs rather quiet. Despite the minimal drawbacks, we still like the machine as a dependable option for the heavy-duty jobs. 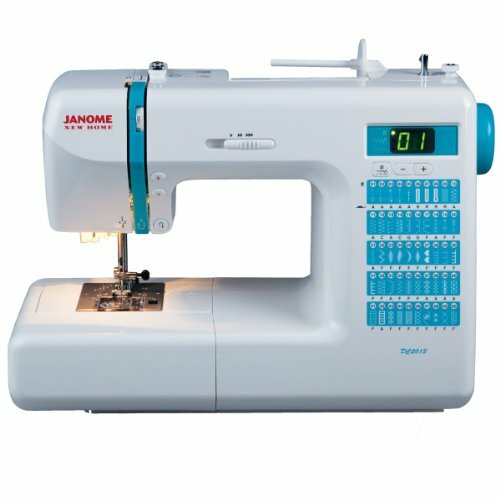 If you want a power horse sewing machine that is also computerized, give it a go with the Janome Computerized Sewing Machine DC2013. Even though there are so many other great-computerized models out there, we give you a closer look to the Janome DC2013 as it’s reliable and made to last. The machine comes with 50 built-in stitches and 3 buttonholes so it gives you plenty of options to choose from on various jobs. 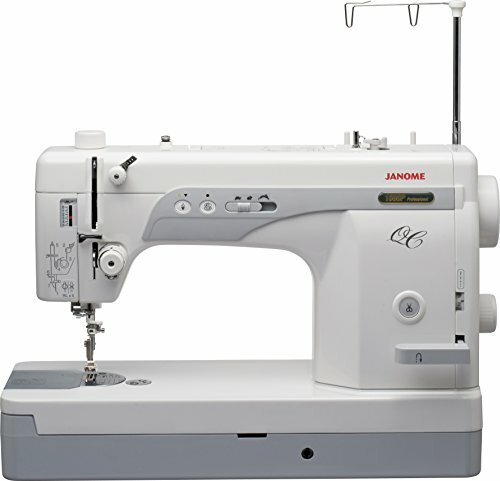 The Superior Feed System (SFS) from Janome is very efficient and ensures nice and accurate stitches. The memorized Up/Down Needle stop position saves you time and makes you more efficient. The machine also gives you computerized direct stitch selection buttons so you can find the right stitches for various jobs/fabrics. The list of features also include the free arm, the drop feed and a locking stitch button. You may find very helpful the reverse button, the auto-declutch bobbin winder and the top loading full rotary hook bobbin. The LED screen is very bright and easy to navigate through. The machine is easy to use and gets through thick layers. It comes with plenty of accessories and is very well made. it’s a strong machine that doesn’t get loud when running. As it’s reliable, fast and strong, the machine brings many great things and only few drawbacks come along. If you like sewing and quilting, getting a heavy-duty machine that takes the intense use and the challenging jobs is a natural step. 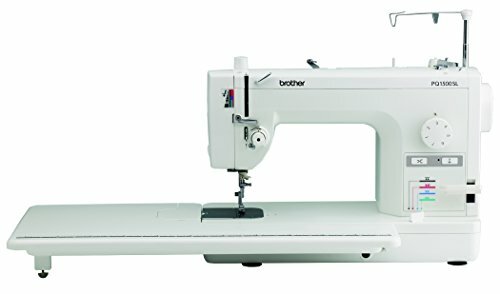 The Brother PQ1500S High Speed Quilting and Sewing Machine is fast, quiet and reliable for various sewing and quilting jobs. The machine has a great design but its features don’t make it a first choice for the unexperienced seamstress. The machine comes with push-button auto thread trimmer, built-in automatic needle trhreader and auto needle positioner. The retractable drop feed dog control and the knee lever for presser foot add to the list of functions. When we said the machine is fast, me had the 1,500 stitches per minute in mind. The speed is increase by the 4 feed dog setting and the adjustable pin feed mechanism. The last one also helps you when move several layers of fabric at once. The bed extension table increase the work area, whereas the easy access point lets you replace the oversized metal bobbin without removing the table. Let’s not forget also the freedom you get from using the knee lifter of the machine. The on-board fabric separator tool lets you sew seams in opposite fabrics with no worries for puckering. A 4-color coded levels of feed dog adjustment is very helpful on the quilting jobs. The list of features continues with the dual threat stand that helps you maintain two thread spools ready. The threading gets consistent and faster due to the thread spool extender. Even though the machine gets so fast, it doesn’t lose its stability. The machine is very well made, has a strong build and takes the intense use. The high quality motor is powerful and there are no misunderstandings related to the use. The instruction that come along are quite clear. The minimal issues don’t over mine the best assets of the machine, which is fast, strong and reliable for both sewing and quilting. You can sure expect better performance and longer life span on your heavy-duty machine, as in the case of the Janome 1600P-QC High Speed Sewing and Quilting Machine. The machine doesn’t bring just the high speed, but also multiple features that make quilting easier. The machine gives you the chance to set a specific speed, according to each job and you may go with a wide range from 800 to 1,600spm. When it comes to ease of use, the features on that begin with the side loading and continues with the industrial rotary hook, for easier quilting. You may also adjust the length on your stitches and use a maximum of 6mm length. You get to safely use the machine every time and in case the presser foot is in up position; a sensor doesn’t allow the machine to start. The memorized needle up/down feature is a big help when working on large items. And, now that we talk about large items, we also need to mention the darning plate that sustains easier free motion quilting. The large working area, the automatic thread cutter, the use of presser foot with no hand involved are also features that help you work faster and easier. The independent motor that allows you to wind bobbin as you sew it’s also important to remind. A slim design surprises any customer, due to its strength. The machine is fast, strong and doesn’t run loud at all. For what is worth, when in need for a power horse for sewing and quilting, the machine is a great investment anytime. If you like to sew a lot but you’re not open (nor think about) for a business, you need a heavy0duty sewing machine that is dependable for the intense use, but doesn’t bring the higher price of more performant models. 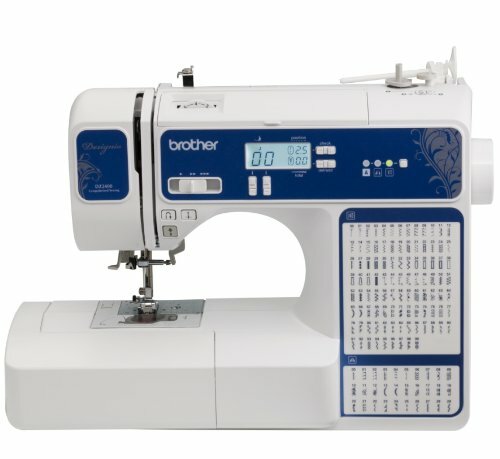 The Brother Designio Series DZ2400 Computerized Sewing & Quilting Machine is that type of machine and it brings you confidence as it has a rugged build and quite some features. The machine features 185 built-in stitches- 130 sewing stitches and 55 alphanumeric stitches. This sure makes it versatile and able to help you on various job applications. If you worry about buttonholes…don’t as the machine features 8 styles of 1-step buttonholes that are automatically sized to fit various buttons. The 1 built-in sewing font gives you also the opportunity to try some monogramming. You may use the blind hem stitch on the hems on skirts and the overcast and zigzag stitches if you like no fraying on your items. The machine sure makes quilting easy as it comes a very wide table that increases your working space by 33%. The list of features is long and it contains the easy threading, top thread and easy bobby winding. The machine also features jam-resistant quick set drop-in top bobbin and an easy to operate stitch selector. You may set various speeds on the machine. The display is large and easy to navigate through. The machine is lightweight, yet stable. It runs quiet and comes with a built-in handle so it’s also easy to carry around. The minimal issues don’t make us change our mind about considering the machine to be a reliable option for the heavy-duty use in a home. Working with leather is both nice and difficult at times, especially if you don’t have the right sewing machine. However, even if you have a good sewing machine, you always need the right needles. 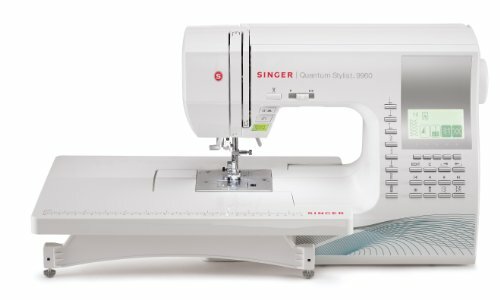 Reliable and ready to take the thick layers of leather, the SINGER 9960 Quantum Stylist 600-Stitch Computerized Sewing Machine is a sure buy and a constant help for the intense use. The machine is highly versatile and presents no less than 600 built-in stitches, 5 various fonts and 13 fully automatic 1-step buttonholes. In terms of features, the machine is quite impressive and comes with automatic thread cutter, automatic needle threader and the possibility to adjust both length and width of stitches. The top drop-in system, the 19-presser feet on the machine increase its versatility and ease of use. The large extension table enlarges the work area and the needle up/down feature helps you work better on larger items. The machine also comes with electronic autopilot and speed control so that you may use the right settings for a specific job/material. It’s also easy to work on cuffs, sleeves and pant legs due to the free arm on the machine. The electronic twin needle control the automatic tension, the warning animation and the drop feed simply make the use easier and faster. The LCD screen is easy to use and fast in reactions. The setup and use of the machine are easy to do. The machine is strong, but not loud when running even through the thick leather layers. As long as you are aware that not all machines are the same, take a chance and give the machine a go for sewing leather. When you truly are into denim (either for fun, either for commercial purposes), using the right sewing machine for denim can make the difference between a really nice denim jacket and a regular one. The DC2014 Computerized Sewing Machine is a sure go for any denim fan as it’s not only able to sew several denim layers, but also helps you be as creative as you wish. The 50 built-in stitches and 3 one-step buttonholes sure help you work better your magic on denim. You get to be efficient and fast also, not only creative due to the SFS (Superior Feed System) on the machine. The Snap-on presser feet lets you find the right pressure for specific jobs, whereas the easy revers button lets you always improve your work. The drop feed, the automatic thread tension control, the memorized needle up/down make the machine reliable, fast and easy to use. The top loading full rotary hook bobbin spares you time on any job. The presser feet include the automatic buttonhole foot, the zipper foot, the satin stitch foot, the adjustable blind hem foot, the over edge foot, the even feed foot. You get to use them in various jobs, according to their names. The speed control slider is easy to operate and lets you adjust the right speed on a specific job application. Let’s not forget the start/stop button for easy operation, not the bright LED screen for better adjustments. The LED screen is user friendly and quite responsive. The machine is durable and presents a good build. It runs smooth, even when sewing multiple denim layers. All things considered though, we definitely go with the machine when sewing some denim jackets. Don’t get intimidated by the speed nor the multiple features of the Singer 4432 Heavy Duty Extra-High Speed Sewing Machine as they are not meant to do that, but to help you even in your beginning. The machine is very fast and goes up to 1,100 stitches per minute. This is why you need to be careful in the beginning, until you learn how to best handle all that speed. The heavy-duty metal frame on the machine gives a good weight and keeps it in place when sewing. The fabric feed is nice and smooth every time as the machine features a stainless steel bedplate that also ensures even sewing. The machine comes with 32 built-in stitches and gets you through the basic styles (6 essential), but also encourages your creativity (18 decorative and 7 stretch stitches). The fully automatic 1-step buttonhole makes things so easy when sewing buttonholes. The automatic needle threader truly wins you so much time on all jobs. The versatility of the machine comes also from the four presser feet that you get to use on specific tasks. You can tell by their names when to use it (zipper foot, button sewing foot, buttonhole foot) and, if you sit on the fence and don’t know which one to go, take your chances with the all-purpose foot. We are not done with the features until we mentioned the top drop-in bobbin with Clear View Cover, the free arm (for cuffs, pant legs), the high presser foot lifter and the three needle positions. The machine comes with a strong motor and is strong, despite its rather small size. 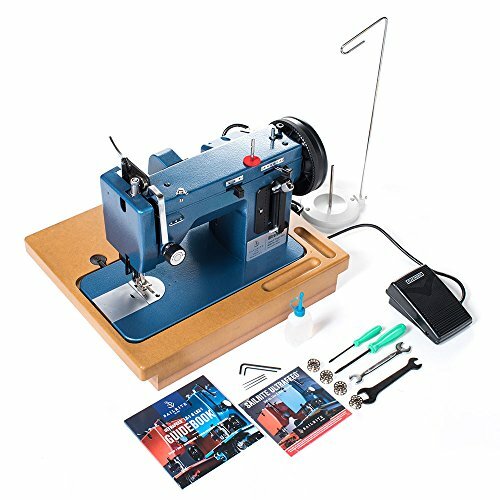 It’s not a heavy weight machine and is sure easy to use, especially if you are a beginner seamstress. The minimal issues don’t make us change our mind about recommending the machine as a great option for any ambitious seamstress, new-entry level or not. Now that you are way passed the entry level on sewing and already work on upholstery, don’t hesitate to try a heavy-duty sewing machine like the Sailrite Heavy-Duty Ultrafeed® LSZ-1 BASIC Walking Foot Sewing Machine. The machine has a rugged build and is designed for the heavy-duty jobs on upholstery. It gets easily through thick, heavy materials like denim, heavy canvas, sailcloth, vinyl, leather, woven and upholstery fabrics. As a matter of fact, the machine is strong enough to get through 10 layers of heavy canvas and 8 layers of Dacron. The list of features of the machine includes the Power Plus Balance wheel, which gives more power than a regular flywheel. Additionally, the patented Posi-Pin clutching system ensures total power transfer from the balance wheel to the needle. We also need to mention the very wide presser foot that features a built-in piping tunnel and a 3/8” foot lift. The machine gives you the chance to adjust size of stitches as they may get as long as 6mm in straight stitch and 5mm in the case of zigzag width. The machine comes with a guidebook that is easy to follow and to understand. The machine has a rugged build and is easy to use. As it’s reliable, powerful and ready to take the heavy-duty jobs on upholstery, the machine still remains a good option when in need. If you work most of the times with heavy-duty materials, you don’t need just heavy-duty machines, but a machine that sews easily thick, heavy weight materials. 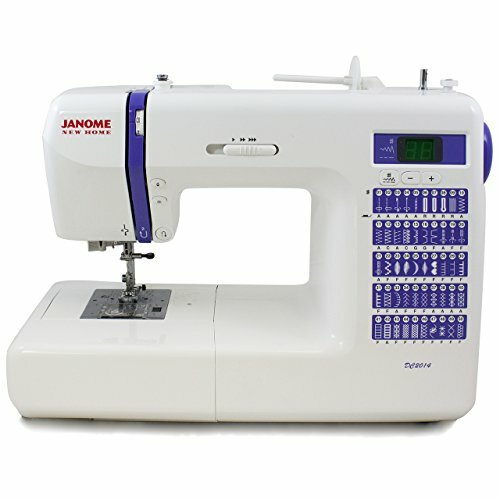 On the other hand, if you don’t run a big business, a heavy-duty sewing machine like the Janome HD3000 Heavy-Duty Sewing Machine will do just fine. There are many features on the machine that we like and that give great performances, even when you work, let’s say, with multiple layers of denim. The machine comes with 18 built-in stitches and one-step buttonholes so you can get creative and win some time on buttonholes just as well. The list of functions starts with the built-in needle threader, the snap-on presser feet and continues with the reverse stitch lever. A foot pressure adjustment lets you get the right setting for a specific job, especially when working on multiple layers of thick fabric. The high presser foot lift, the push-pull bobbin winder ease up your working efforts and the free arm simply solves the problems when working sleeves, cuffs or pant legs. The machine is easy to use and the multiple features that come along do that. The list isn’t quite over and we do need to mention the thread tension adjustment just as well. The heavy-duty aluminum body gives the machine stability and adds a good weight. The machine is durable as it has a very good build. It’s not loud when running and it’s very dependable. Despite the minimal problems, the machine is ready to take not only the heavy use, but also the multiple layers of heavy-duty materials anytime. 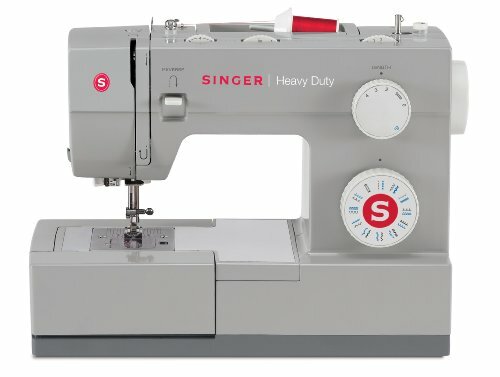 Get ready for a great, long lasting and performant computerized sewing machine that also gets your quilting jobs done. 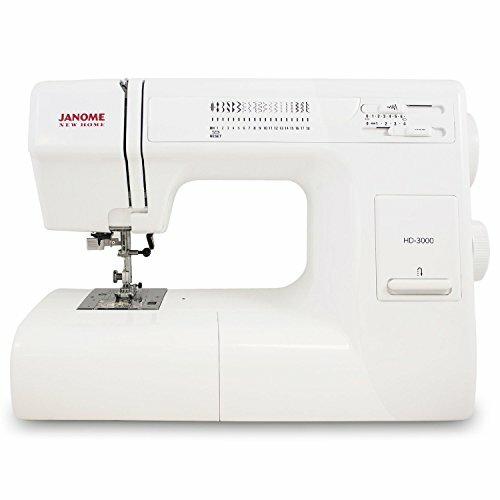 You need to pay the extra buck for it, but the Janome MC-6300P Professional Heavy-Duty Computerized Quilting Sewing Machine sure is worth every single penny you pay for it. The machine is encouraging you to get creative as it comes with 66 built-in stitches and 4 buttonholes. It’s strong enough to sew multiple layers of fabrics, no matter how thick they are. The feed mechanism lets you feed smoothly the fabric every time. The drop feed control, the light LED display ease your efforts. The LED display reacts really fast and is easy to follow. It gives you many info’s on your job, including the low bobbin indicator light or the twin needle guard. Your work looks nice in the end thanks to the automatic thread cutter, no matter how fast you are. As you can get really, fast, up to 1,000 stitches per minute. The work area is very large and the 9”x5” throat space is quite big. The 5 different blanket stitches for applique and hand-look stitch are so nice to use when quilting. Moreover, when you work in tight spaces, the “turtle speed” is a big help. The machine does great when free motion quilting just as well. You don’t need to remember all your stitches as the machine includes programmable memory recall. The machine is easy to use and so it’s the setup. It comes with instruction that are clear and easy to understand. The machine is dependable, durable and has a great build and stability. All things considered, we like the machine, as it’s dependable as a computerized sewing and quilting machine. Don’t get intimidated by the numerous features and performance of the Janome Magnolia 7318 Sewing Machine. It’s very easy to use by any new-entry level seamstress, but it has a strong build, which makes it long lasting and reliable. The machine comes with 18 built-in stitches and one four-step buttonhole, which is enough to get you through the basics, but also to push your limits a bit whenever you feel ready for it. The features on the machine are efficient and we need to mention the top loading jam proof bobbin system and the 7-piece feed dog. If the first feature minimizes risk for tangling when sewing, the second one lets, you had better control precision over the fabric. We also notice the free arm for easier sewing on cuffs, sleeves, leg pants, and the very high presser foot lift for better control on specific jobs. The push-pull bobbin winder saves you some time, whereas the top loading full rotary hook bobbin and the stitch selection dial let you have the right setting for specific jobs. You get to do easily use the manual thread tension dial, the stitch selection dial and the stitch length dial. The reverse lever and the stitch chart are also to mention. The storage compartment keeps the accessories at reach and minimizes cluster work area. The machine has a good build and gives great performances, as small as it is. It comes with instruction that is easy to follow. Cons or not, when you are determined to get better in sewing and try a heavy-duty machine, the Janome Magnolia 7318 is worth to try.